Aberfeldy & District Gaelic Choir won the coveted Provost Archibald Brown Cup at the Dhailriada Provincial Mod in Lochgilphead on Saturday 22nd September, despite fierce competition from several other top choirs. It was a poignant win for the Aberfeldy Choir, as just three weeks ago they lost their conductor of many years, Frances McCallum, who has left the area. With very little time before October’s National Mod in Fort William, the Choir was faced with the unenviable task of finding a new conductor, preferably one with roots in Gaelic music and language. Aberfeldy's quartet Fuaimeach scored 92 for Gaelic and 90 for music, to win the Quartet class at Lochgilphead for the third consecutive year. 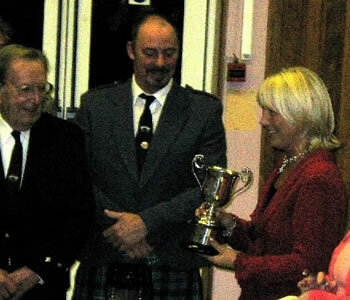 Soprano Gilliain MacDonald also won first prize for the Own Choice competition, and the award for highest aggregate marks in the women's solo classes.